11 a.m.: Free, Tiger Tales for children ages 3-5 at Cotsen Children’s Library (repeats weekly). Noon: Princeton University Men’s Baseball vs. Cornell at Clarke Field. 4:30 p.m.: Princeton University’s Fund for Irish Studies welcomes writer Kevin Barry for a reading from his novel Beatlebone at the James M. Stewart ’32 Theater at 185 Nassau Street. Free. 6 p.m.: C.K. Williams Reading Series for Emerging Writers at Labyrinth Books welcomes Saeed Jones and Princeton University students. 7:30 p.m.: Princeton University Orchestra (PUO) Season Finale at Richardson Auditorium. PUO will perform works by Mahler and Hindemith (also on Saturday, April 29). 7 a.m. to 9 a.m.: Spring Bird Walk at Bowman’s Hill Wildflower Preserve in New Hope, Pa. A $3 donation is suggested for The Preserve’s non-members. 9 a.m. to 1 p.m.: Princeton University Men’s Heavyweight Crew vs. Brown at Shea Rowing Center at Carnegie Lake. 10 a.m. to 2 p.m.: National Prescription Drug Take-Back Day. Mercer County residents are encouraged to dispose of unused and expired prescription pills by bringing them to the parking lot across from the Mercer County Administration Building at 640 South Broad Street in Trenton. This event is conducted by the Mercer County Sheriff’s Office in cooperation with the US Department of Justice. Noon to 5 p.m.: Uncork Spring Wine Festival at Mercer County Park in West Windsor Township. Wine sampling from 15 New Jersey wineries, food trucks, and live music. For tickets, visit newjerseywineevents.com (also on Sunday, April 30). 1 to 5 p.m.: Princeton Truck Fest 2017 along Prospect Avenue. Food trucks, musical performances, raffles, and games. Proceeds from this family-friendly event will benefit Send Hunger Packing and Meals on Wheels. Attendees can purchase meal tickets at the event. 1 p.m.: Princeton University Women’s Lacrosse vs. Columbia at Princeton’s 1952 Stadium. 2 p.m.: Spring Handbell Concert at Miller Chapel on the campus of Princeton Theological Seminary. Free. 2 to 4 p.m.: “Dos Amigos” paintings by Jim Buchanan and Bill Griffith now on view at the Winery Tasting Room at Terhune Orchards. 3 p.m.: Princeton University Men’s Tennis vs. Penn at the Lenz Tennis Center. 7 p.m.: The Princeton Singers in Rachmaninoff: All-Night Vigil under the direction of Steven Sametz at Trinity Church of Princeton. Admission is $25 adults and $10 students. 1 to 4 p.m.: The Millstone River Morris Dancers of Princeton perform at Terhune Orchards as part of their May Day celebration. 1 to 6 p.m.: Communiversity ArtsFest 2017 produced by the Arts Council of Princeton features over 200 booths showcasing original art and contemporary crafts, unique merchandise, and cuisine from local chefs. Also, six stages of live entertainment. 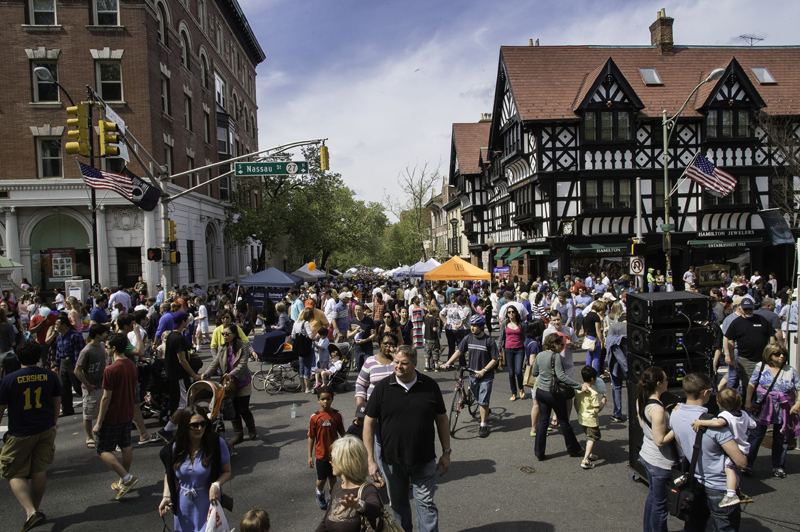 The event typically draws over 40,000 visitors to downtown Princeton.